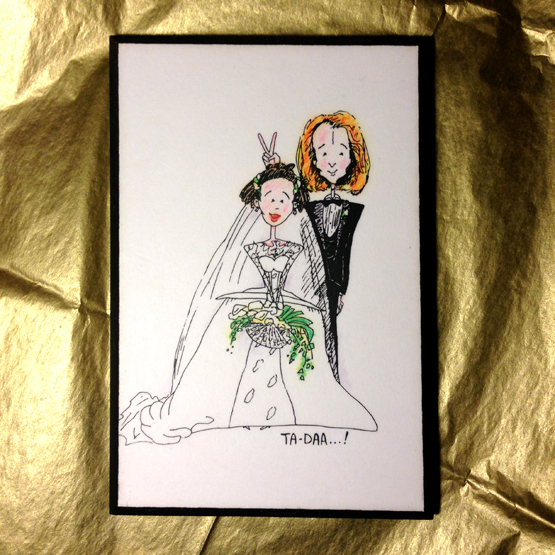 The Animated Woman: Just married...22 years ago. We became engaged after one month of dating; we just knew. It's our 22nd wedding anniversary today and I'm feeling nostalgic. I went through the wooden box of treasures from our wedding back in 1992 and found a couple of cute things to share with you. 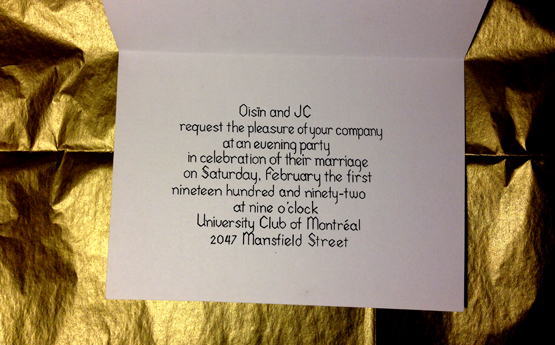 Ois and I did have some "official" fancy wedding invitations that my parents insisted on. But we wanted to do our own version too, so I drew this. He doesn't look so enthusiastic about being glomped in this drawing; but I sure do! 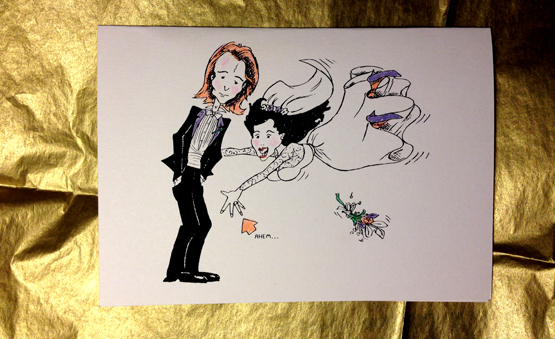 And these were our thank-you cards for the guests. It's pretty cool to be able to spend the rest of my life together with this person. I'm pretty happy I found him - I mean, what if our paths had never crossed? The HUZ figures we'll have 25 more years together; he reckons he'll be the first to pop his clogs. I don't know, but I can't bear to think about life without him. That's Oisín in the video. He's pretty special. When you know, you just know, you know? Someday I'll draw the story of how we met in London. Happy Anniversary, husband of my days, father of my children! Love you both! Happy Anniversary! Wishing you years and years of hugs, giggles and *ahem* use of good hands! This made me tear up. We talk about how Gerri gets to go before me, but I get to go two days later, because it would be too hard to go on. I hope I can hold out that long. I wish you both all of the happiness that's available to two people. Hugs. I really hope I'm still this loved up in 22 years! When you meet the nicest person ever, prolly a good idea to marry them. I always like it when you stop by to say hi, Jo. Hi Brian, really, you kept the ring for 4 months, and didn't lose it or anything? I tease. You should know that I gave a lecture at a college this past week; the topic was empathy in blogging. At the end I named 7 blogs worth checking out and yours was one of them. This particular created me personally rip upward. All of us discuss exactly how Gerri reaches proceed prior to me personally, however We reach proceed 2 times later on, simply because it might be way too hard to take. I really hope I will hold on which lengthy. We desire both of you all the joy which can be found in order to a couple. Hugs.